When Royal Mail announced that Post and Go machine M001 was being installeed at RAF Northolt's BFPO facility, some people asked where it had been before that. The IAR website is silent on the subject, showing no 'history' on the relevant page. So it happens that a complete coincidence has led to my being able to reveal the answer and show an example. As you can see, these were purchased on 16 March 2015, at a time when the machines at Crewe and Bradford North were printing the location on their stamps. This stopped on 30 March when rates increased. 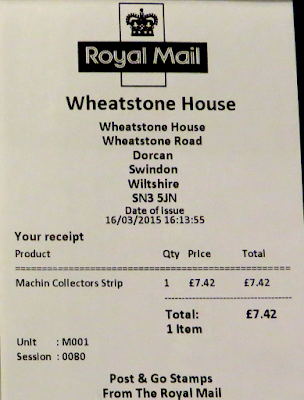 and as you can see from the receipt, this is in Swindon. Wheatstone House is the base for ROMEC, Royal Mail's facilities management company, but there is (or was) also a Delivery Office there, because RM had adverts for postmen/women-drivers there. On the other hand the local newspaper said that the DO was closing with relocation nearby, so only those really in the know can explain. Anyway, my contact says that the machine was located at the training centre part of Wheatstone House and was accessible to anyone visiting the site, from outside contractors to postal staff. Apparently it did take cash but changed to card-only in early March. M001, the first of the new Royal Mail Enquiry Office kiosks is being moved from its location in Wheatstone House to an Enquiry Office to help with the Christmas rush. A site survey is being carried out this week, and we will confirm venue and installation date shortly. No indication that Wheatstone House is in Swindon, and it never did turn up in 'an Enquiry Office'. My guess is that that move did not happen, and it was eventually removed for transfer to BFPO after servicing. Machine M001 was installed in Wheatstone House on 10 February 2015. The primary purpose was as a development machine for the Enquiry Office Upgrade Project where new features could be tested prior to going live in offices. The machine never took cash – there is no facility to do so. Wheatstone House was chosen because it is the base for Royal Mail Engineering (as opposed to ROMEC) who undertake the various business approvals for any new equipment. The machine was available for use by staff and visitors but only as a straightforward stamp vending facility. The overprint was removed, along with Crewe and Bradford, following feedback from collectors, so that the same stamps could be obtained from any enquiry office site (ignoring the print string variants). Therefore stamps, with and without the identifier are in the marketplace. The machine was removed in October 2015 ( I don’t have an exact date) as there was no further requirement for it following approvals of its new features. It was then refurbished and was lined up to go to another enquiry office but the project is holding on five machines at present. M001 was therefore held in store for the period prior to installation at BFPO Northolt on 27 January 2016. Have you ever seen a Post and Go stamp from machine M001 in 2015, mint, used, on eBay or actual? Dates and session numbers will be most useful. The Royal Mail site in Wheatstone Road in Swindon is spread over a number of buildings. As well as the Swindon Mail centre (which handles post for the RG, SN & OX postcodes) it also houses Romec and one of the Walk Bundling Centres where leaflets are organised for door to door deliveries. Also on site is the delivery office for much of Swindon town itself. This is quite often referred to as Dorcan. It was extended last year to take over the work formerly done at the Hawksworth Delivery Office where, since the move away from bikes to vans, there was insufficient vehicle parking space. With Romec being there, the mail centre is quite often used to trial new machines and methods of working. It is also the originating point for the various slogans which appear on postmarks. Thanks for the wider view. As indicated in Royal Mail's comment, this is nothing to do with ROMEC but Royal Mail Engineering. Wheatstone House Swindon - separate site although right next door to the Mail Centre - amongst other things on the site (Post Office Stores, Swindon WBC, Swindon DO, Stamp facilities etc) is the location of PETRA (Postal Electrical & Technical Repair Agency - staffed by RM Engineering) who deal with R&D, software updates and hardware repairs for most of the RM Mech systems. They also test post boxes for durability, resistance to forced entry/explosives so wouldn't be too big a step to assume some works were carried out there on M001. Wheatstone House has also held trial versions of post boxes in the offices including pillars made of plastic featuring LCD displays. A little extra information from Ebay. The listing was for a single first class label and receipt. 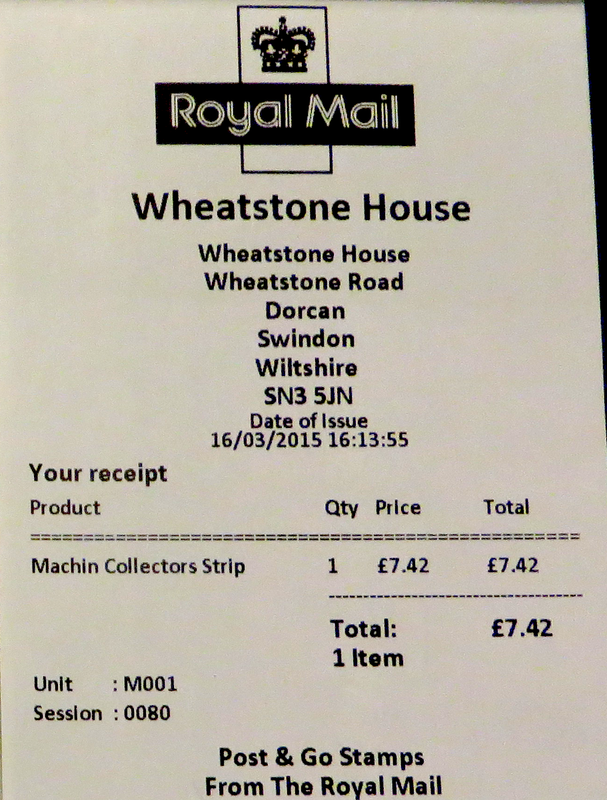 The receipt is for a "1st class machin strip" priced £3.78, though only one label is offered. The label differs from the one you show in that it does not show the "Wheatstone House" text. This text is present only on the receipt. The M001 is clearly visible on the label, which is a MA13 Machin, as noted in the lot description. The receipt is dated 30/03/2015. It is session 0085. The item was sold by Ebay seller thedevoniun on 16th Feb 2016. It realised £16 after receiving 6 bids. The seller gave his email in the lot description. First day at Northolt was 27 Jan.
Aside from the glaring date error the machine is able to issue a surface rate label, something that the NCRs can’t do, thought given their spread through pre-existing WHSmith run Post Offices and the large labels being introduced more generally, it may only be a matter of time, also no VAT codes. Set of 36 M001 on eBay, not mine, 9 days to go > http://www.ebay.co.uk/itm/112339602252?